Craggy Gardens is a mountaintop area located along the Blue Ridge Parkway not far north of Asheville, NC in the Great Craggy Mountains range. Peaks top out at over 6000 ft in elevation, while the Parkway in this area ranges from about 4600 ft to 5600 ft, making it one of the high altitude areas to escape the summer heat and enjoy early fall color. 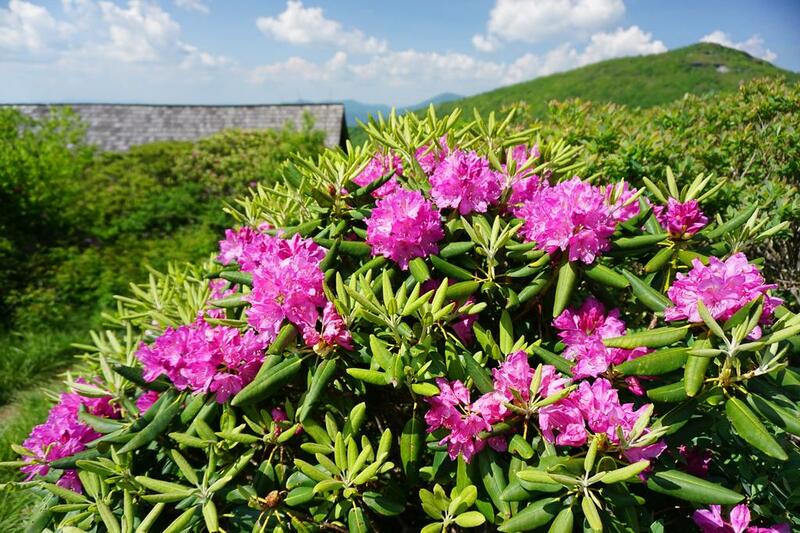 Blooming Catawba rhododendron, part of what gives Craggy Gardens its name. The Craggy Gardens trail connects the Visitor Center with the Picnic Area, sharing a portion of the path with the Mountains to Sea Trail. It's a moderate hike, with a spur trail at the high point that leads to the gardens area and an overlook. The trail is extremely popular, but highly recommended, and is one of the best hikes in the region. The Craggy Pinnacle trail starts one parking area north of the Visitor Center, at the Craggy Dome overlook. It's short, but it leads to one of the best summit views in the range as it reaches the very top of this sharp-peaked mountain. This trail does not connect to the others in the area without a walk on the Parkway. The Mountains to Sea Trail passes through the entire Craggy Gardens area, sharing a portion of path with the Craggy Gardens trail. It can be used to tie all the other trails in the Craggy Gardens area together. The Snowball trail is a US Forest Service trail which starts off the Mountains to Sea Trail just west of the visitor center. It leads across Snowball Mountain to Hawkbill Rock, where a great view back to the east of the primary ridge of the Great Craggy range. A lesser-used trail, it's most easily accessed from the first junction on the Picnic Area spur road, or from the Picnic Area itself, but it can also be accessed from the visitor center via the Craggy Gardens trail. The Douglas Falls trail is a US Forest Service trail which connects to the Mountain to Sea Trail on Craggy Pinncale. It's accessible from the visitor center parking area, and descends 3.5 mi to the 70-ft free-falling waterfall of the same name. This is a more strenuous trek with over 1500 ft of elevation gain. The Craggy Gardens picnic area offers a mountaintop setting with a good number of tables on a hilly site. Wheelchair-accessible restrooms with flush toilets, water, tables, fire rings, and grills are available at the picnic area in a mixture of open and shady sites. 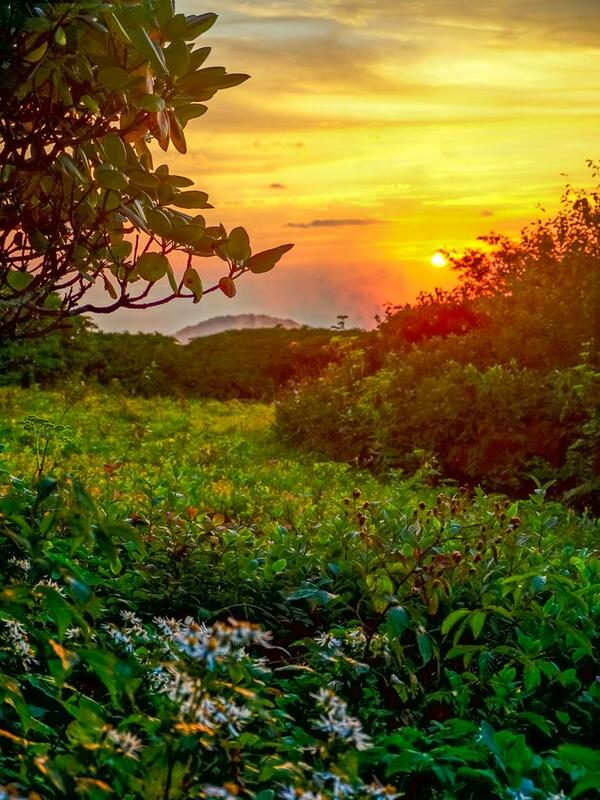 The Craggy Gardens trail starts within the picnic area and the Mountains to Sea Trail runs through it as well, meaning you can start your hike directly from the picnic area. 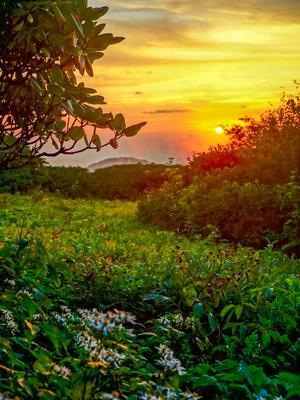 The Craggy Gardens visitor center, open from May - October, has some exhibits on the flora, fauna and geology of the area, as well as a small Parkway store with books, maps, and local art. Stop in for a warm-up on a cold day or to sit a spell and look out at the view. Restrooms are available under the visitor center building, but they are not wheelchair-accessible.